There is a lot in Daniel Kahneman’s book “Thinking, Fast and Slow” of interest to mediators and people involved in conflict. The book sums up a lifetime of work in psychology and economics, and serves almost as a catalog of cognitive biases we encounter in business, the legal system, and elsewhere. One chapter describes the optimism bias, which may be essential to making capitalism function, but which also leads to many costly decisions for individuals. For example, the optimism bias leads entrepreneurs to expect success in opening their own small business such as a restaurant, despite the knowledge that the majority of such businesses fail within a few years. Kahneman also describes a similar bias he calls the planning fallacy, which leads groups planning many kinds of projects to underestimate the time required to complete the project and the likelihood of its success. People simply cannot see, and therefore cannot plan for, unexpected obstacles or problems they may encounter in completing their project. 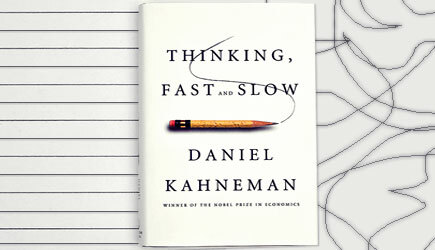 As an example, Kahneman describes a curriculum development project he was involved in years ago which aimed to produce a new course and textbook. At one point when the work seemed to be proceeding well, he asked the other members of the team to estimate how long they thought it would take to complete the project. Their estimates averaged about two years. Only then did he think to ask a co-worker about the success rates of projects similar to theirs, and learned that such efforts had a 40% risk of failure, and generally took 7 to 10 years to complete. The most amazing part of this story is that this information, while slightly discouraging, had no effect on the group’s plans. They still thought they would complete their work within the time frame they estimated, and chose not to abandon the project. They of course encountered numerous unforeseen obstacles, and spent eight more years to complete their textbook which was ultimately never used. Parties involved in lawsuits or other kinds of conflict exhibit these same biases. People tend to think their situation is unique, and are not dissuaded by statistics applicable to similar cases. They believe in the rightness of their positions. They therefore frequently overestimate their chances of success. They also underestimate the costs and risks of pursuing their claims because many of these costs and risks cannot be discerned until they arise. Another suggested idea is called a “premortem,” in which someone practices giving an explanation of how the project at hand could ultimately fail. I would be cautious about trying that in a mediation, because people generally resist the idea of explaining how they might lose a case. In that setting, sometimes the only counter to one side’s overly optimistic view of their position is hearing the overly optimistic view of the other side. Kahneman’s work also provides a good explanation for why many disputes do not get resolved until after parties have directly felt some of the costs and setbacks and delays that people typically encounter in the legal system. We are most impressed with what we experience ourselves, and apt to think that what happens to all the other fools who get involved in legal disputes has little bearing on us.